From left: Sheriff Tom Knight, Chief Financial Officer Lisa M. Kiesel and Director of Planning and Research William J. Spitler. Sheriff Tom Knight presented two awards during a ceremony Wednesday to employees who demonstrated exemplary service to the Sarasota County Sheriff's Office. 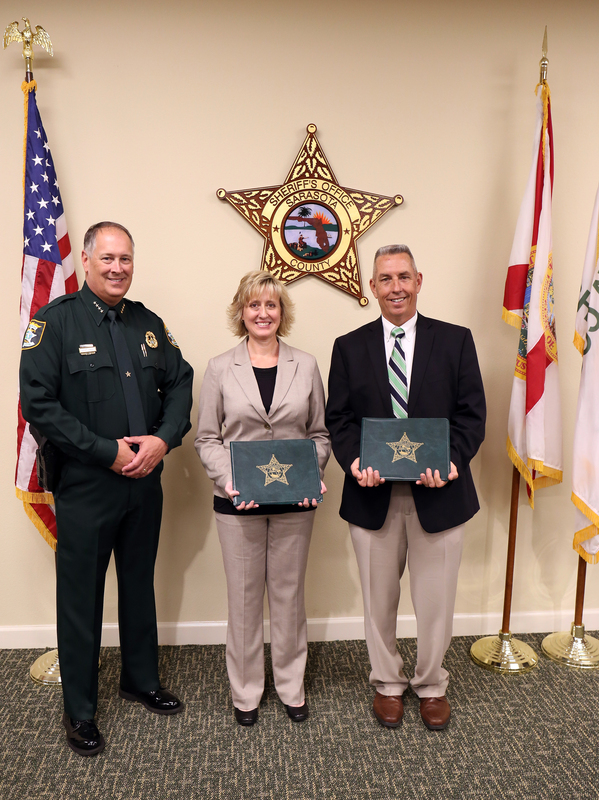 Chief Financial Officer Lisa M. Kiesel and Director of Planning and Research William J. Spitler were presented with the Meritorious Achievement Award, recognized for their dedication and tireless work to provide the employees of the sheriff’s office with a new facility. Directors Kiesel and Spitler often worked long hours, coming in early and staying late to meet with contractors, county staff, or accepting the delivery of goods for the new building. Both were then given the task of planning the logistics of moving nearly 200 employees along with their desks and computers to the new headquarters. With keen attention to detail, diligence in reviewing and allocating funding, working with vendors and sheriff’s office employees alike, both Director Kiesel and Director Spitler displayed integrity and determination. Due to their hard work, a significant portion of the sheriff’s office workforce is housed under one roof, greatly improving the efficiency of operations. For the first time in 30 years, all science-related units are now located in one area. This includes Property and Evidence, Forensics, drug and digital forensics labs, Automated Fingerprint Identification System unit, and detectives. In addition to streamlined operations, the new headquarters provide four separate break areas, a fully equipped fitness center with showers, and ample conference room space for employees to conduct daily meetings.